Riverina Ultimate Wool Team player Ross Wells and his grandson Angus. The story of the jumper and the blazer is below. I was sitting at my desk a while back when the phone rang. On the other end of the line was one of those warm country voices that might ask you if you had any rain last week. It was Ross Wells, wool grower from up round Jerilderie – Billy Brownless country. “Dud Probyn was my uncle,” he said. I had met Dud Probyn in Brisbane in about 2005. Dud was thought to be the oldest living St Kilda player then and I went around to where he lived in Stafford to meet him. He was a ripper bloke and, although coming to the end of his life, was full of good fun and stories. He had a big beard and was happy to tell a tale or two and give you his thoughts on modern footy. Dud had left Wedderburn in the 30s to find work. He rode his pushbike to Mildura and then worked along the Murrumbidgee. When the work ran out, still on his pushbike, he pedalled on. “I botted me tucker all the way to Canberra,” he told me. Then on he went to Sydney where he played at one of the clubs before heading back to Melbourne. He played for St Kilda during the Second World War. He then played in the country. This coincidence – that Ross was Duds nephew – was too much! We agreed to catch up some time, and an opportunity presented in the form of the The Australian Sheep and Wool Show in Bendigo a couple of weeks ago. 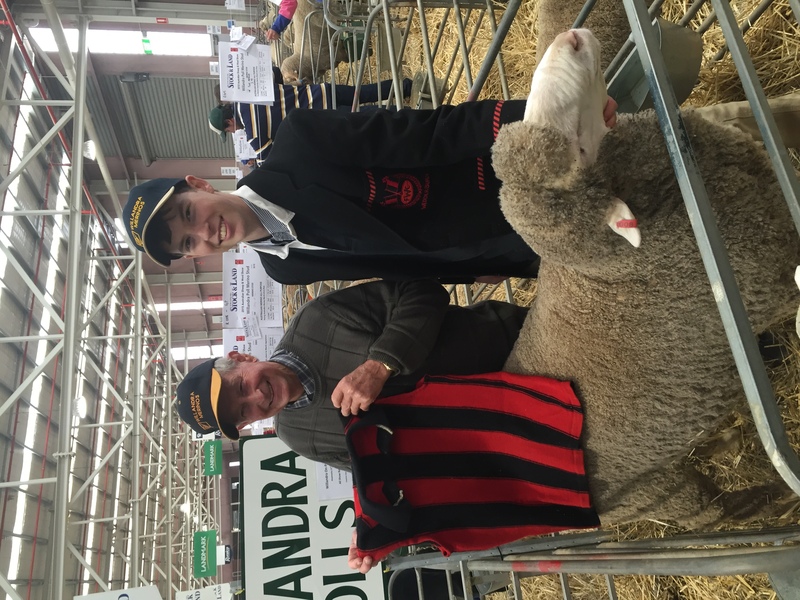 Wool growers from around the nation bring the finest of their flock to a few massive pavilions at the Bendigo Showgrounds. It’s a chance for people to catch up with each other, while celebrating fine wool and the creatures which provide it. So, I have the kids who have the day off school to further their wool education. And we’re wandering around the main pavilion. I am chatting with Marius Cuming of Australian Wool Innovation when a senior gent carrying a Gladstone bag comes striding over. 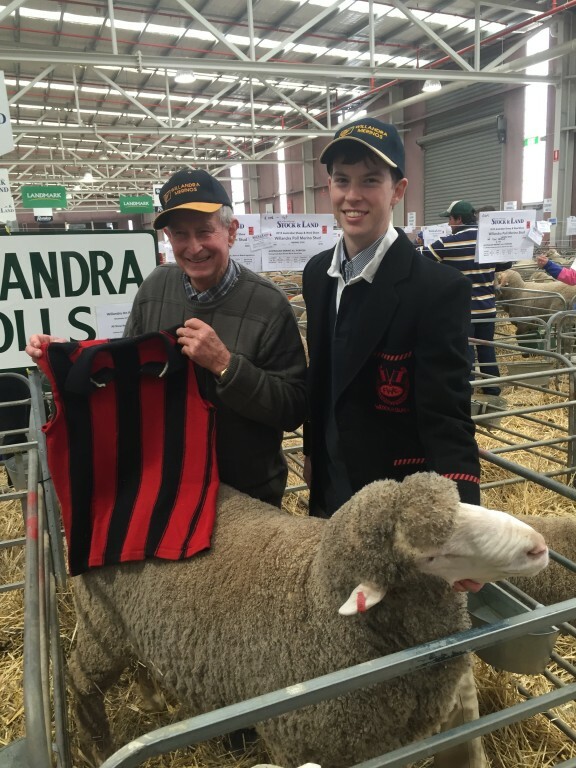 We are introduced and Ross shows me his classic old woollen Wedderburn jumper. Angus has been brought along to model the woollen Wedderburn blazer from the late ‘50s as well. “I told you: I’m no chance of fitting into it,” Ross says. Angus does the job elegantly. We continue looking at sheep. The Fibre of Football stall proves a meeting place for those who love footy and wool. The bar is also popular. We head back to Melbourne in the 4 degree evening. Ross Wells has done his chances of staying in the team no harm. For the current Riverina team, click here.